Real talk: Your bathroom will never truly feel like a spa (unless you have a facialist and masseur on staff, that is). However, it should feel like a refuge. After all, nothing kills the buzz of a relaxing hot shower faster than stepping into a cramped, cluttered bathroom. Even if you can't do anything about your square footage, you can make a small bathroom feel larger, airier, and more elegant with some simple tricks. The most impactful way to brighten your bathroom and make it feel larger is to paint it white. But if you're not feeling an all-white bathroom, introduce another soft shade, like pale grey, as an accent color. The key to creating a serene bathroom is keeping the surfaces clear and products out of sight. So, instead of plain mirrors and pedestal sinks, opt for built-in storage like a medicine cabinet and a sink with drawers or cabinets underneath. Even if you add storage, ask yourself what you really need. Channel Marie Kondo and do a hard edit on your hair, skin, and makeup products and appliances. Keep just the items you use on a regular basis, and get rid of the rest. Good bathroom lighting is like a good mirror: It just makes you feel better about yourself. If possible, layer the lighting so that you're not just getting it from one source at one level, like the dreaded single overhead fixture. Also, if you have a window (and the neighbors can see in), choose a window treatment that still allows light in. The one nice thing about a small bathroom (yes, there is something good about it) is that you can afford high-end materials that might otherwise be too expensive if your space was larger. 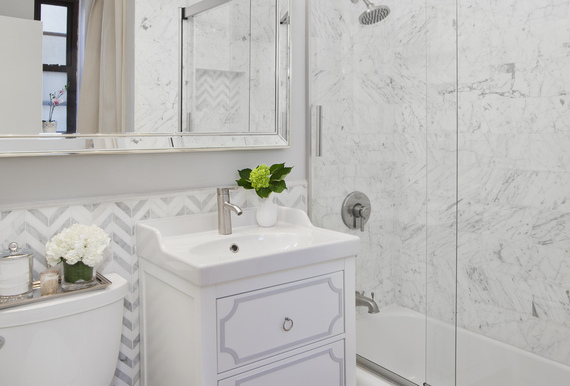 So, don't shy away from decorative tile and Carrara marble-they might just be in your budget.